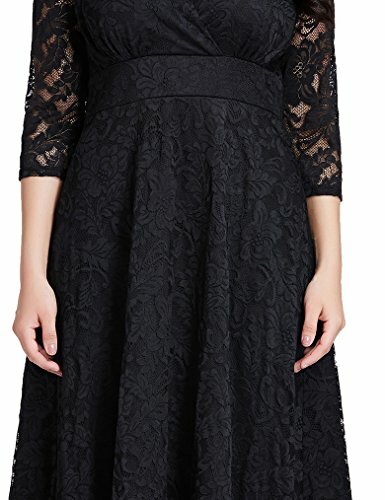 If your body has curves, add feminine presence and show off your curves with this sheer sleeves lace dress. This dress has a fitted bodycon top with a surplice v-neck below the bust, giving a high-waisted empire appearance. Together with a midi length A-line skirt for skater silhouette. Side zipper for easy wearing. Made with stretchy lace with floral pattern, partially lined. The empire dress helps to length your body and make you appear taller. 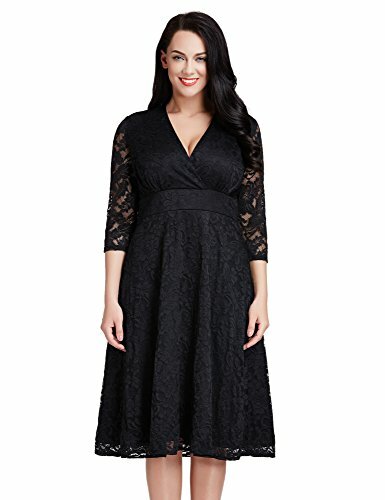 Perfect for mother of the bride, formal, semi formal, evening, cocktail, maternity, etc. Available in black, navy blue, white, maroon, green, apricot, royal blue, grey and coral. Imported. 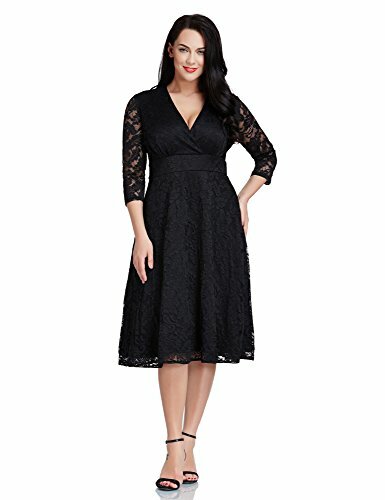 US 4: Fits Bust: 33.5-34.5" ; Fits Waist: 25.5-26.5"; Fits Hip:36-37"
US 6: Fits Bust: 34.5-35.5" ; Fits Waist: 26.5-27.5"; Fits Hip:37-38"
US 8: Fits Bust: 35.5-36.5" ; Fits Waist: 27.5-28.5"; Fits Hip:38-39"
12W: Fits Bust 39-41" ; Fits Waist 32-34"; Fits Hip 41-43"
14W: Fits Bust 41-43" ; Fits Waist 34-36"; Fits Hip 43-45"
16W: Fits Bust 43-45" ; Fits Waist 36-38"; Fits Hip 45-47"
18W: Fits Bust 45-47" ; Fits Waist 38-40"; Fits Hip 47-49"
20W: Fits Bust 47-49" ; Fits Waist 40-42"; Fits Hip 49-51"
22W: Fits Bust 49-51" ; Fits Waist 42-44"; Fits Hip 51-53"
24W: Fits Bust 51-53" ; Fits Waist 44-46"; Fits Hip 53-55"
26W: Fits Bust 53-55" ; Fits Waist 46-48"; Fits Hip 55-57"
28W: Fits Bust 55-57" ; Fits Waist 48-50"; Fits Hip 57-59"
30W: Fits Bust 57-59" ; Fits Waist 50-52"; Fits Hip 59-61"
32W: Fits Bust 59-61" ; Fits Waist 52-54"; Fits Hip 61-63"
It runs small than the normal size, please order ONE SIZE UP. Just because your figure has curves doesn't mean you can't enjoy a pretty little black dress, little white dress or little red dress. Also available in navy blue, green, apricot, coral, grey and royal blue. And nothing looks sexier than showing a little skin like this sheer sleeves lace dress. 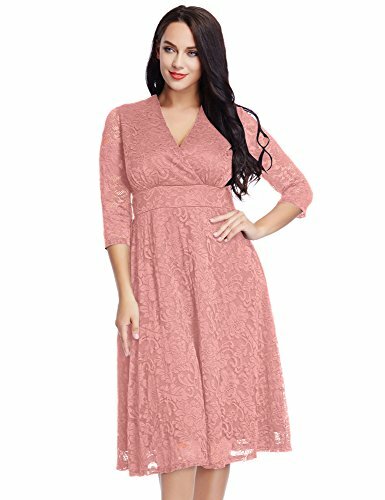 The dress has a fitted bodice with a surplice v-neck ending just below the bust, giving a high-waisted appearance, and a gathered skirt which is midi length and loosely fitting. Comes with a side zipper for easy wearing. A midi dress that goes just to your knees it'll make you appear taller, and the height appears to diminish any additional weight you may have. The dress is made with stretchy floral lace with lining in similar color with the lace. The shape of the empire dress also helps to lengthen the body's appearance. 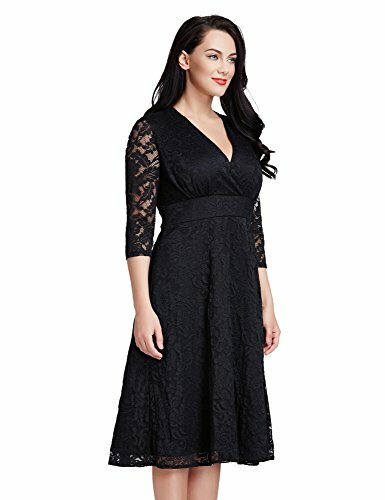 Perfect for mother of the bride, formal, semi formal, evening, cocktail, maternity, etc. Model is 5'9", bust 40.5", waist 33", hip 42", bra cup D, wearing size 12W. Falls to over knee midi length.